Good morning. My congratulations to the Law Society on turning 110 years old. A century and a decade of remarkable achievements and contributions to Hong Kong. Sixteen years ago, I, together with a group of fellow professionals, founded the Hong Kong Coalition of Professional Services, of which the Law Society was one of the 10 founding members. Our purpose was to promote Hong Kong professional services overseas - in the Mainland of China, and beyond. Since then, professional services have grown into a major sector. In the 10 years between 2004 and 2014, the GDP contributed by professional services grew by an average rate of 8.7 per cent annually. Today, in terms of its contribution to Hong Kong's total GDP, professional services ranks with tourism. Over the past 14 years or so, we have managed to establish a strong foothold in the Mainland - which is nowadays undoubtedly the biggest overseas market for Hong Kong professional services. And the trend is promising. According to the National Development and Reform Commission, last year, our trade in services with the Guangdong Province - including legal and financial services, accounting and architecture - increased by 40 per cent on the previous year. Going forward, we need another engine. That engine is the Belt and Road Initiative. Covering 4.4 billion people in some 60-plus countries, and accounting for over 30 per cent of global economic value, the Belt and Road will surely create huge, and fresh, opportunities. Last year, the Mainland of China's direct investment in Belt and Road countries amounted to US$14.5 billion. The expansion of trade, investment and infrastructure building along the Belt and Road will surely lead to a rise in demand for legal services - contract negotiation, contract management and dispute resolution, among others. There is no question of Hong Kong sitting on its hands and letting these business opportunities pass. The question is how we grab these opportunities, not just today and tomorrow, but also in the coming decades. The question is how we leverage Hong Kong's obvious and unique advantages. Our advantages are, indeed, obvious and unique under the "one country, two systems" arrangement. Under "one country", we are part of China and enjoy the "China advantage". Our services, including legal services, enjoy preferential access to the Mainland market under CEPA - the Mainland and Hong Kong Closer Economic Partnership Arrangement. After 14 years of CEPA, Hong Kong professional services across the board are well known to clients in the Mainland - for our expertise, for our independence, and more importantly for our professional conduct and ethics. Under "two systems", we practise, so to speak, "the other system" that is different from that of Mainland cities - a separate economic and social system - and are a highly international society. And the international community is familiar with our legal system and our common law. In short, our combined advantages under "one country, two systems", our trilingual ability and our international network make us an ideal partner in legal services for both the Mainland Chinese and international companies. We can help foreign enterprises grow into the Mainland market, and partner with Mainland Chinese firms in expanding into foreign markets, including those along the Belt and Road. And that is why we are building a legal and dispute resolution services centre here in Hong Kong. For the Asia-Pacific, and for the Belt and Road. The Hong Kong Government is fully behind our professionals, lawyers included. The Secretary for Justice has been promoting Hong Kong's legal and dispute resolution services around the world, visiting such countries as South Korea, Australia, Thailand and Dubai, among others. The $200 million Professional Services Advancement Support Scheme, PASS, announced in my 2016 Policy Address and launched last November, supports Hong Kong professionals in enhancing exchanges and co-operation with their counterparts outside Hong Kong. The dedicated Belt and Road Office, set up last year to map out strategies and policy initiatives under the Belt and Road, is helping our companies and professionals in reaching out. The Belt and Road website is now up and running, and a compendium is being distributed. You will find there the many footprints of Hong Kong professionals and enterprises in the Belt and Road countries already. In other words, in many of these nascent markets, when you venture out, you will not be alone. At the same time, the Hong Kong Monetary Authority's Infrastructure Financing Facilitation Office, also set up last year, has helped companies invest in infrastructure projects. The Office now counts some 60 members, from financial agencies, banks, investors, law firms to insurance companies. 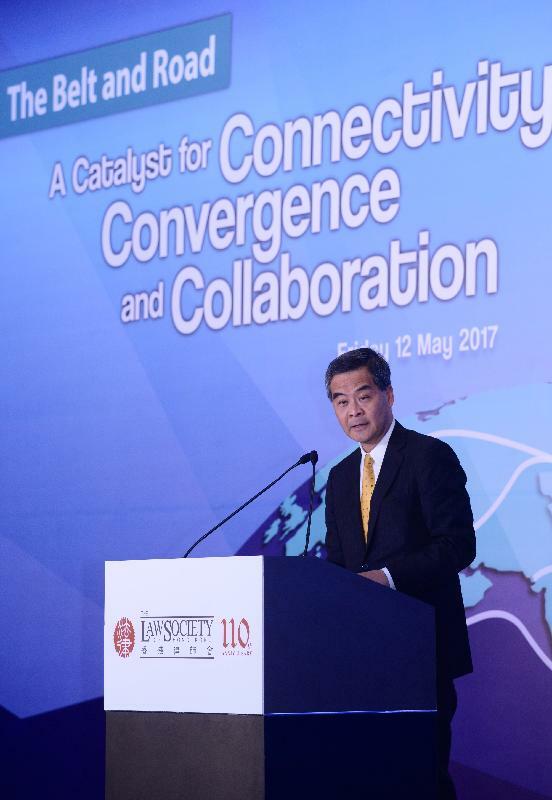 I take heart from the Central Authorities' support for Hong Kong - including our professional services - in participating in the Belt and Road Initiative. When Mr Zhang Dejiang, Chairman of the Standing Committee of the National People's Congress, attended the Belt and Road Summit in Hong Kong last May, he highlighted Hong Kong's advantages in professional services - law, accounting, financial services, engineering, consultancy, and others. The Chairman said that, and I quote, "We support Hong Kong's efforts to build a centre for international legal and dispute resolution services in the Asia-Pacific, in order to provide legal and arbitration services to the Belt and Road." Unquote. So Hong Kong's legal profession - all of you here today - are critical to creating the "connectivity, convergence and collaboration" essential to the success of the Belt and Road. 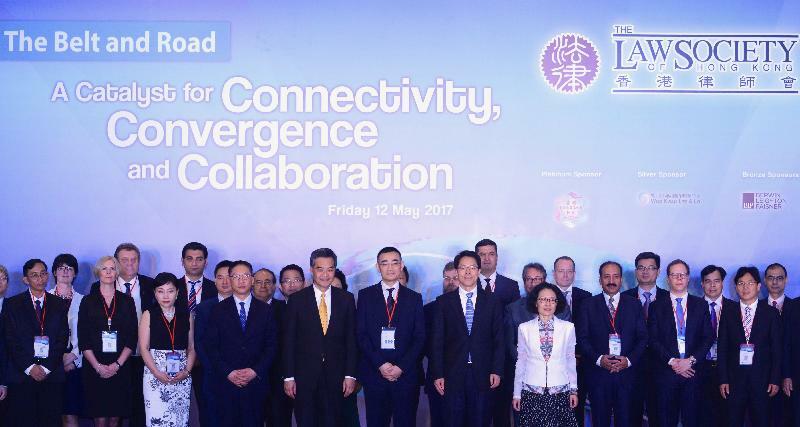 On connectivity, we are the "super-connector" between the rest of China and the Belt and Road countries. On convergence, we are at the forefront. And on collaboration, particularly international collaboration, we are second to none as we are the freest economy in the world, for 23 years in a row. This March, Premier Li Keqiang announced in the Hong Kong and Macao section of the Central Government's work report the launch of a joint study to prepare a development plan for the Guangdong-Hong Kong-Macao Bay Area. This region, an important hinterland for Hong Kong, encompasses 11 cities and a total population of 66 million. Last month, I led a large delegation to visit Guangzhou, the provincial capital, and the five cities in the western part of the Pearl River Delta region. I was deeply impressed by their rapid developments. Last month, I met with the Law Society at Government House on how the Government can better support the legal profession in reaching out - to work with Bay Area enterprises and the Belt and Road countries. This is work in progress. The Government and I very much welcome your input going forward. Ladies and gentlemen, my thanks to the Law Society of Hong Kong for organising today's conference. I wish you all a fruitful discussion, and the best of success long down the Belt and Road.